A moment she’ll cherish forever. 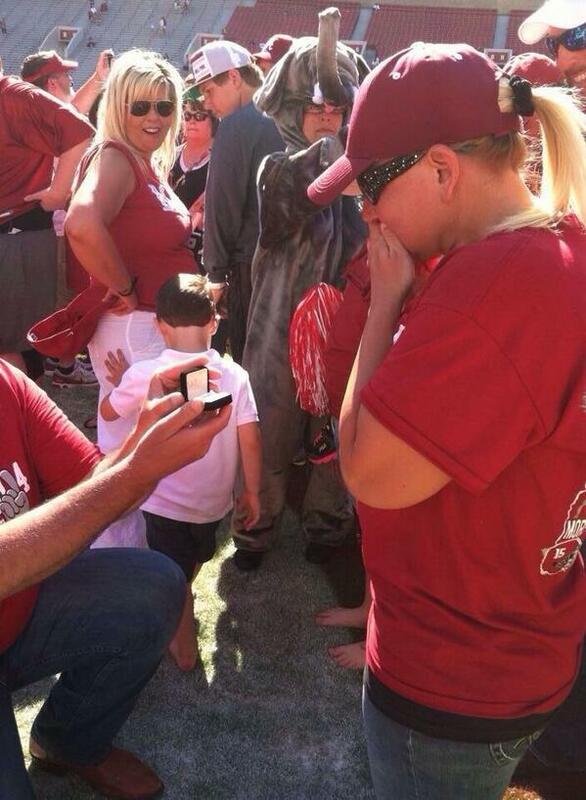 ‘Cause nothing says romance, Alabama-style like proposing at an A-Day game with some dude in an elephant suit looking on. Mark Richt jokes that Georgia’s current receivers situation is bad for Mike Bobo’s health. Even when everyone comes back in June as anticipated, it’s still gonna feel a little iffy. Scott-Wesley is all but guaranteed to miss the opener against Clemson. And given his track record, you wonder if Malcolm Mitchell could get injured in a stiff wind. One good thing is that the Tennessee game is in Athens this year, so at least that Neyland turf won’t be a factor. But it’s obvious they know what’s missing from the offense with those two out. Scott-Wesley didn’t practice this spring and Mitchell was out all spring after sustaining what Georgia called a left leg injury on the first day. Mason said their absence kept Georgia from going uptempo as much as it would have liked due to a lack of numbers. What’s interesting, and maybe even a little surprising, is that the coaches are clearly counting on some of the freshmen receivers coming in the summer contributing this season. I’m not sure if that’s a reflection of the fear of more injuries, or the quality of the on-campus receiving corps behind Bennett, Davis, Mitchell and Scott-Wesley. If it’s the latter, Jonathon Rumph sounds like he’s in danger of becoming the forgotten man. Just another thing to keep an eye on this August. It’s Emmert’s world and he’s just living in it, part two. For some reason, they keep letting the man talk. I don’t get it, but there it is. You can read this high-minded “where we are” editorial in its entirety if you’re so inclined, but here’s a little taste of how detached it is from the facts on the ground. One of the reforms Emmert calls for is a reduction in time demands on student-athletes. Sport-related time demands need to be reduced, so student-athletes can participate in the full educational experience while at college. This could include opportunities such as studying abroad and internships. All I can figure is that he’s forgotten about the summer, because the NCAA issued a new rule permitting eight hours a week of required preparations then for the regular season. Allow football student-athletes to participate in preparations for the season during an eight-week period each summer. Those weeks can include eight hours per week of required weight training and conditioning. Up to two of the eight hours can consist of film review. Student-athletes who participate in the summer activities must be enrolled in summer school or meet specific academic benchmarks. The model is similar to those adopted by men’s and women’s basketball in the last two years. Both the Football Bowl and Football Championship subdivisions supported this change. Oh, “allow”, you say. Let Mark Richt tell you what “allow” means. Richt said in some ways it was good when players had to push for teammates to work out. He pointed out that on-field throwing and catching work, pass protection and pass rush still isn’t mandated. I sense another NCAA regulation coming. Thanks, Mr. Emmert! It’s Emmert’s world and he’s just living in it, part one. Terry Rupert, athletic director at Division III Wilmington College in southwest Ohio, said he expects Division I to remain intact and credits the big-money schools for trying to improve the welfare of student-athletes. “They kind of got away from that as the money got better,” said Rupert, a member of the NCAA executive committee. I think the NCAA is confused about our confusion. You may recall that last month I was impressed with a student seating plan that Michigan adopted. How’s that working out, anyway? It turns out there isn’t a seating plan in the world compelling enough to overcome being charged $295 for a home schedule “in which the best game is against Penn State and the race for second is between Indiana, Minnesota, and Maryland…” Hmmm. Go figure. Maybe they just need more loud music on the Big House PA. It turns out after adding on new schools for his television network, Jim Delany approached Dan Beebe about a swap of conference names. Beebe told Delany to buzz off. Boy, wouldn’t you have liked to have been a fly on the wall once Delany got off the phone after that conversation? I guess nobody’s told Delany there isn’t a Big Fourteen conference out there. Uncooperative is the new black. FSU drops its Title IX investigation of Jameis Winston because Winston won’t talk. Now word comes that the NCAA has ended its probe of Mississippi State over alleged illicit benefits published in a Yahoo! Sports report. The reason? Not because there wasn’t any direct evidence. Yahoo! reported that Davis purchased airfare for former MSU football players Fletcher Cox and Chad Bumphis while they were still in school. Yahoo! authenticated a flight purchase in Dec. 2011, before Mississippi State’s Music City Bowl appearance later that month. Cox declared for the draft after the bowl game and Bumphis played another season. Nah, it’s because the NCAA “can’t find” Davis. They hung A.J. Green with less. We are such chumps at Georgia.